This is a stunning tray. It is heavy glass and very well made. It looks just as it does in the pictures. The honeycomb is bright gold and the bees are a pewtery- silver. It is a real statement piece. Uttermost's Accessories Combine Premium Quality Materials With Unique High-style Design. With The Advanced Product Engineering And Packaging Reinforcement, Uttermost Maintains Some Of The Lowest Damage Rates In The Industry. Each Product Is Designed, Manufactured And Packaged With Shipping In Mind. Thick Clear Glass Tray Features Polished Silver Honey Bees Sitting Atop Bright Gold, Honeycomb Sculpted Handles. 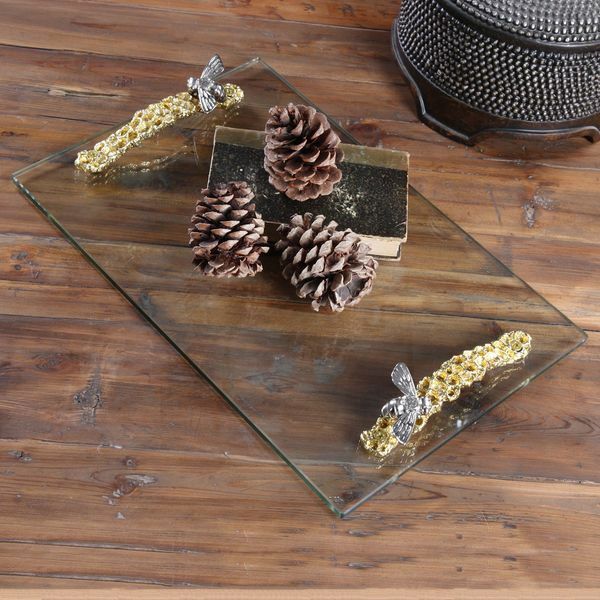 Thick Clear Glass Tray Features Polished Silver Honey Bees Sitting Atop Bright Gold, Honeycomb Sculpted Handles.